“Song” is another word of interest because Luo Dan’s photographs, interspersed throughout the volume, come from a series entitled Simple Song. In an end note, we’re told that these are photos of the Lisu ethnic minority in a remote, autonomous region of Yunnan, and that the photographs were made through the laborious collodion wet plate process. It’s a long process which yields “exquisite detail,” but “during which time the subject must remain perfectly still.” For some of these photographs, especially those in which scenes are suggested (#24: two women of great contrast in color and size face each other on a narrow path; #25: John raises his hand to ring a bell in Laomudeng Village), this means the illusion of candidness. Sze-Lorrain’s first sentence in her prefatory note is: “While my impulse in composing this note was to think aloud, this first sentence has already been revised more than once.” I mention all this to gesture at the labor that goes into seeming simplicity, the staging and revision required. The process of such labor is an enmity with language, which can fog or halt as much as it might elucidate or open. tomorrow a cork-tree on mountain’s peak. we will see each other, we will not be known. barn become valley become world. This is the ending of “Arctic Circle,” and the poem’s cosmic interrelatedness is a variation on Sze’s use of the sublime, an exquisite illusion of cause-and-effect that is ultimately shown to be synchronicity. The sparks are constant, and the world is, if not united, at least connected. Has the universe gotten too narrow? How does a thing get buried? Put the train out of mind . . .
It’s remarkable to consider that a collection of writing organized under the conceit of locality brings us finally back to the universal: across localities, boundaries of era or language. We see this enacted in geographic landscape, too: Karen An-hwei Lee’s short work of fiction, “Vestiges of Sea Pilgrims,” with its haibun-like dialogue with Emily Dickinson, guides us through places of water in Los Angeles as a whirlpool into Venezia, Rome and Greece, Japan, and Paris. This is an expansive instance of the “And Beyond” we encountered in the anthology’s title. Woeser’s essay, “Rinchen, the Sky-Burial Master,” deals with natural landscape as place but also as identity. The essay is a short piece of ethnography whose central anguish is how to represent a piece of one’s culture without exoticizing it. The essay begins sharply: “Another writing about a sky-burial master is sure to be suspected of having chosen a sensational subject just to get attention. 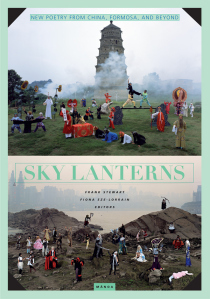 When one brings up sky burials, all kinds of exotic stereotypes about Tibet leap to mind.” (This might also apply to Sky Lanterns itself, of course, which has proven idiosyncratic and cosmopolitan even in its representation of Tang Dynasty poetry.) The essay has a pointed awareness of the tourism industry, for better and for worse, and Woeser mentions having gone in a previous year with a TV production team from Taiwan to see a staged sky-burial, in which a dressed-up cow’s leg was used instead of a human corpse. She’s also aware of the gaze trained on her by others: that traveling with two cameras around her neck makes people assume she holds the permissions of a traveling journalist. Although it could be said he had several identities, I understood that deep down he was, after all, a typical nomad. The identity had been given to him by history, but his identity seemed to me redundant now, and vanishing without a trace. It was futile to expect that I could have found in him the identity that I had sought in the beginning. Somehow, this made me feel sad, but also relieved. It is precisely the pluralism of their identities that turns a great many Tibetans into two, three persons, sometimes even more. Many thanks for these meditative and incisive comments on SKY LANTERNS. The review is a wonderful piece of writing in itself. Thank you for your kind words, Pat. We’re glad you enjoyed Henry’s post, and are grateful to MANOA for giving us the chance to review SKY LANTERNS in the first place!